Our final article on Endeavour. The last few lines got me, I'll admit. One of the things that I always have, and always will, love about this site is the personal touch such as the one in this article - the fact that we do, as a site, passionately care about the subjects which we write about. What a great way to give Endeavour an honourable send-off, great work Chris G.
I can't stress enough the surreal stunning experience of walking around a street corner and there is a spacecraft sitting in a parking lot. My favorite of the fleet. It was America saying we will not quit after Challenger in fact we will build a replacement, and when I read the new name in Aviation Week and Space Technology it was the perfect name. This was a deep experience to see her so loved by so many people coming to see her. Classrooms of children walked over to see the spaceship in the parking lot. One day I am certain another spacecraft shall bear the name. I posted this before, but will again. Picture I captured during sTS-134 with Endeavour flying in formation with ISS. She should be flying, not on the mean streets of LA. Beautiful Chris G, absolutely beautiful. She will long be remembered for her outstanding service. Hopefully many will remember the people behind her that made those missions and dreams a reality. A true inspiration of the American dream to boldly go beyond and reach for tomorrow. I only wish the calls of USA! USA! USA! during her final move were directed to the future of American Spaceflight, not the past. The SpaceHab is a nice touch. Slightly off-topic question: how many SpaceHab modules were built? What is the flight history of this one (apart from STS-116/118)? The room pictured in the article is already open to the public in the main Science Center, 2nd floor. The other OV-105 room is the future building devoted to the Shuttle and that has not been disclosed yet. it's probably going to be a while before i can get back to southern california. is there any reason to expect that the temporary display will change from its current configuration (museum attendees can walk underneath endeavour) in the next few years? i'd assume there will eventually be a well-publicized closure of the temporary display so that it can be moved into its permanent home's vertical configuration. but i'd hate to learn that the current configuration had an interim step, in which it was lowered off of the yellow crane and mounted on its landing gear -- necessitating an udvar-hazy-esque closure of public access to the space underneath it. 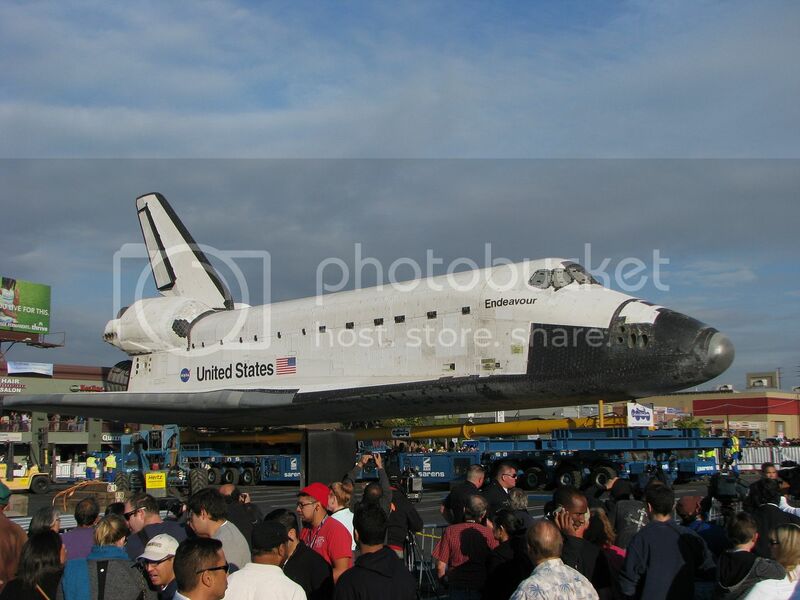 so, if i want that underneath-endeavour photo op, do i need to get to california in 2013, or will 2014 or 2015 do? Part of the reasoning behind leaving Endeavour on the overland transporter was to facilitate its eventual move to the Samuel Oschin Air & Space Center. There are no plans therefore, to lower Endeavour's landing gear. And currently, there are no plans to restrict access under Endeavour — but one cannot state definitively what might happen over the next four years.